PUNE, India , Jan 21 2019 (IPS) - One of the most laudable initiatives of the current government’s regime is the Swachh Bharat Mission (SBM) that was launched on Oct 2, 2014, with a larger vision of a clean India. The critical aspect of the mission was that—unlike many of the movements that preceded it—this had a measurable outcome (making India open defecation free) and a firm timeline (by 2019). Having a mandate like this from the government gave nonprofits already working in the field of urban sanitation a major impetus, since prior to this it was a space largely neglected by policy makers. Even corporates, foundations, and public trusts started looking at the sanitation space and began aligning their vision with the Government of India’s by channelling their funds towards the same. Over the last four years, there is a lot that the SBM has achieved. Through the gaps in the programme, however, there are important lessons that we can learn on what work needs to be done to help meet the mission of a cleaner India, and how best we should go ahead with that work. With the deadline of Oct 2, 2019 fast approaching, it is important to take a holistic view of the positive outcomes of SBM. Communities have been mere witnesses through this process of making India Open Defecation Free. They have not been made a part of the process which should ideally have been a prerequisite, in order to make it sustainable. The core programme focuses on ensuring the building and usage of toilets to reach a national Open Defecation Free (ODF) status. Since October 2014, according to the central government, SBM (U) has equipped over 5,219,604* households with toilets, and 417,496* community and public toilets have been delivered. A whopping 3,362* cities have been declared ODF, which accounts for 94 percent of the targeted cities. If we have to reach the target of an ODF India in less than a year, we need to study some of the gaps in the SBM, and identify certain key action and policy recommendations. One of the major drawbacks has been the absence of use of granular spatial data to make informed decisions and plan targeted interventions. Unavailability of evidence-based data has been a lacuna of the SBM model—which, combined with the preconceived notion that the urban poor will not have space for a household toilet—has resulted in urban local bodies (ULBs) continuing to provide community toilets instead of individual household ones. Since the authorities possess very little or no concrete data about certain areas of the cities—particularly slums—there is no solid means of monitoring the progress of the ongoing as well as completed work. Lack of critical data on existing infrastructure and household level data often leads to skewed delivery, where households have toilets with no drainage networks or lines to connect to and vice versa. The measurability of the campaign has been largely focused on the construction of and access to toilets—the actual need assessment and behaviour change has not been measured with the same exuberance. This happened because communities have been mere witnesses through this process of making India ODF. They have not been made a part of the process which should ideally have been a prerequisite, in order to make it sustainable. To make India ODF, just the construction of toilets is not enough. Areas such as behaviour change, monitoring and tracking, and faecal sludge management are some of the other parameters that need attention. b) Monitoring and tracking: The process of monitoring and tracking the programme has not been given due attention. For example, the current SBM model provides funding support to people in instalments—one given prior to the toilet being built, and the other after it is completed. However, as this Policy Review Paper (commissioned by Shelter Associates) points out, because this process has not been rigorously tracked, there have been some unintended outcomes. It has led to either abuse of funds by families or delays in releasing instalments by ULBs (resulting in families swamped by debt even though their toilet stands completed). What’s more, there have been several instances where families who built a toilet had no drainage networks to connect to, thereby wasting premium space in their homes occupied by these toilets. c) Faecal sludge management: Owing to sanitation being just one of the vital components of a larger value chain, the subsequent component of faecal sludge management should also be taken into account, and end-to-end solutions should be propagated. Instalment model: Where the ULB transfers money into the bank accounts of the people served in two or three instalments for construction of toilets. Contractor model: Contractors are appointed and paid for by the local municipal corporation to provide material and construct toilets in households. This is a fully subsidised model where people get a free toilet. However, as evident by the work done by both models (in Maharashtra), each of them has significant gaps that need to be addressed. In the instalment model, there can be significant delays in the release of funds resulting in financial hardship for the family. On the other hand, families may utilise the first instalment—which is given before construction starts—for purposes other than building a toilet, for which, the ULB has no recovery mechanism in place. Overall, as a model, this is time consuming and tedious for the ULB. The contractor model, while faster, gives the people served no control over the quality of work that is executed, as it is free. This often leads to dissatisfaction as people get shoddy toilets which start falling apart very soon. One solution can be to draw upon CSR funds to deliver household toilets on a cost sharing basis. CSR money can be used to buy the material, which is then delivered at the doorstep of the individual, who then constructs it at their own cost. Only those houses that have access to a network are prioritised. The remaining houses get toilets as and when the ULB lays the networks. This is a model that we at Shelter Associates have tried. The last area of improvement would be to create a larger role for the community, civic body organisations, and nonprofits in the entire process, right from awareness building to the actual delivery of the product. The national political leadership has certainly succeeded in sustaining the impetus to achieve ODF status by giving it visibility over the last four years. 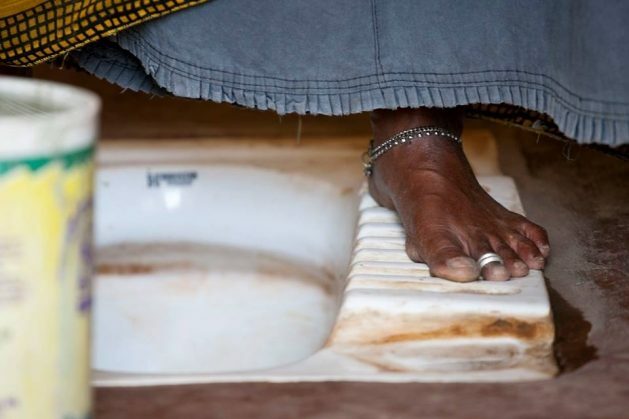 While a lot remains to be achieved, it took foresight to put toilets on the national agenda. Pratima Joshi has worked in the area of affordable housing and sanitation for the urban poor for nearly 25 years. Having completed her Masters in Architecture (Building Design for Developing Countries) from Bartlett School of Architecture and Planning, University College (London), she is widely recognised as a leading planner and designer of slum infrastructure. She is one of the co-founders of Shelter Associates (SA), which aims to convert slums into housing societies for the poor by giving access to basic services like water, sanitation, and electricity, which urban slums often lack. Pratima is an Aga Khan scholar, Ashoka fellow, and Google Earth Hero (the only Indian to have received it).